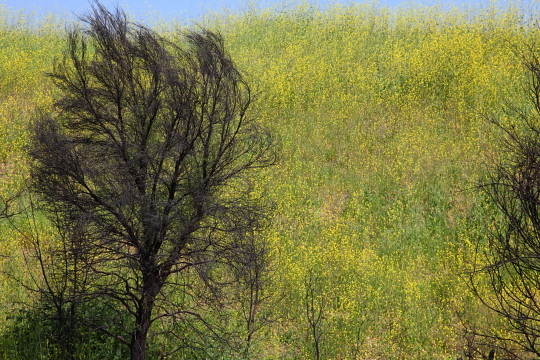 This week’s photo is a shot that Bryan took during our photo hike through Chino Hills State Park. Well actually I hiked and he rode his mountain bike. It has been about 4 months since the fire burned 90% of the park. The only evidence of the fire are a few charred trees but the wildflowers have really grown like crazy and made for beautiful landscape shots. I like the photo that Bryan chose of burned tree in front of a wall of yellow wildflowers. What a great place to photograph. To see more pictures of Chino Hills State Park, check out our GALLERY. Photo Info: Shot with our 5D Mark II. ISO 160, F9, at 1/250 of a second.